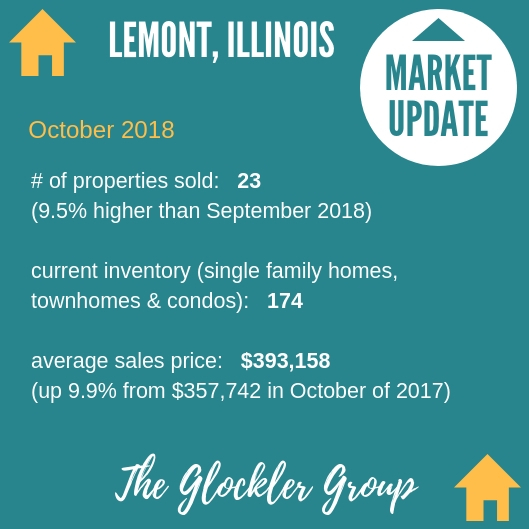 Hello, here is your October 2018 residential real estate market update for Lemont, Illinois, brought to you by The Glockler Group. October Property sales in Lemont were 23, down -4.2% from 24 in October of 2017 and 9.5% higher than the 21 sales last month. October 2018 sales were at their lowest level compared to October of 2017 and 2016. What does that mean? As a buyer, you may be in a good position as sellers may be more eager to sell. The Median Sales Price in Lemont in October was $420,000, up 31.3% from $320,000 in October of 2017 and up 15.9% from $362,250 last month. The Average Sales Price in October was $393,158, up 9.9% from $357,742 in October of 2017 and down -2.4% from $402,939 last month. October 2018 ASP was at highest level compared to October of 2017 and 2016, which is great for sellers! If you are looking to buy or sell real estate in Lemont or the neighboring suburbs – call The Glockler Group. Since 1978, we have been helping home buyers and sellers, with professionalism and integrity. We are affiliated with Coldwell Banker Residential – the #1 Brokerage in Chicagoland in closed sales and volume! Our experience in the local market is unparalleled. (708) 529-5839.